Aunsoft Final Mate is the recommended best MTS Merger, which supports merging/joining 2 or 3 or multiple MTS files into only one MTS file without conversion and losing any quality. 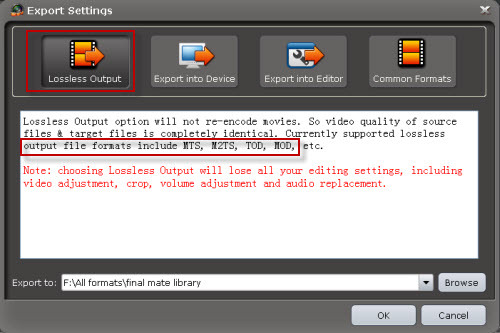 If you owns camcorder like Canon HF200, which creating native MTS files, if you want to merge/join these MTS files into only one MTS file and keep its native HD quality, you can use Aunsoft Final Mate to merge/join Canon HF200 MTS files into one raw MTS file with no loss of quality. Now I will show you a fast way to merge raw Canon HF200 MTS recodings into one file without conversion. Step 1. Capture native MTS files from Canon HF200 camcorder to Aunsoft Final Mate. From the timeline, you may notice the vernier, which is used as time pointer. Click on the Vernier, and move to the timeline you want to cut, and click the Split button to cut the video. Then select the unwanted or unimportant parts and click Delete. To change video sequences, just click on the video clip on timeline, drag and drop to the left or right for the position as you like. One movie will be exported as one file with Aunsoft Final Mate. Step 3. Merge/join multiple Canon HF200 MTS files without conversion. Click the Export button and then choose Lossless Output and click the OK button, the MTS/MTS Joiner will start merging large Canon HF200 .MTS files into one MTS file without conversion at the fast speed. The non-conversion process will prevent loss of quality when merging Canon HF200 MTS files. 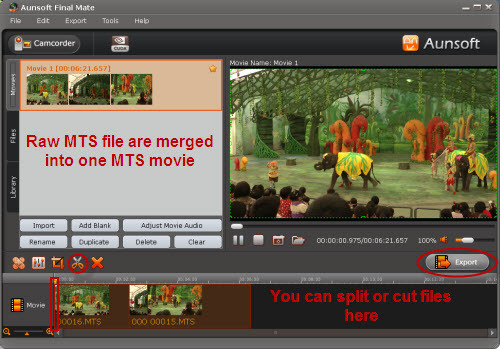 If you think that MTS/MTS file is so large that can’t play smoothly on media players or portable devices, you can also use this program to convert MTS or MTS file to MP4, AVI, MOV, WMV, etc with smaller size for playing. How do I Use Droid X Camera for Recording with Best Quality?